What constitutes a plum draw for O’Neill’s men? There was no play-off despair this time around for Republic of Ireland, as Martin O’Neill’s valiant side secured a well-earned place at Euro 2016 having survived the group of death, leaving Irish eyes fixed on Saturday’s pivotal Euro 2016 draw. Despite wrestling four points off world champions Germany in the qualifying phase, Ireland find themselves in Pot 4, the lowest pot, owing to a reasonably poor record of reaching major tournament finals. While such results over the most recent World Cup recipients should ensure the Irish fear nobody in the group stages, there are certainly teams they would prefer based on history and vice versa. According to Ladbrokes at least, Ireland’s hopes of glory at the tournament are still on the lean side, at 80/1, though if they were to reach the knockouts then anything would suddenly seem possible. Here at news.ladbrokes towers we conducted some research into possible scenarios and have picked out the best and worst possible outcomes for O’Neill’s side when the draw is made. The forecasted groups are decided on previous head-to-head meetings and separated by points-per-game and as mentioned above it may surprise many to see who the favoured Pot 1 titan would be. A draw in Gelsenkirchen and a famous victory in Dublin back in October during qualifying and only four losses in 11 games overall, make Germany the preferred choice. 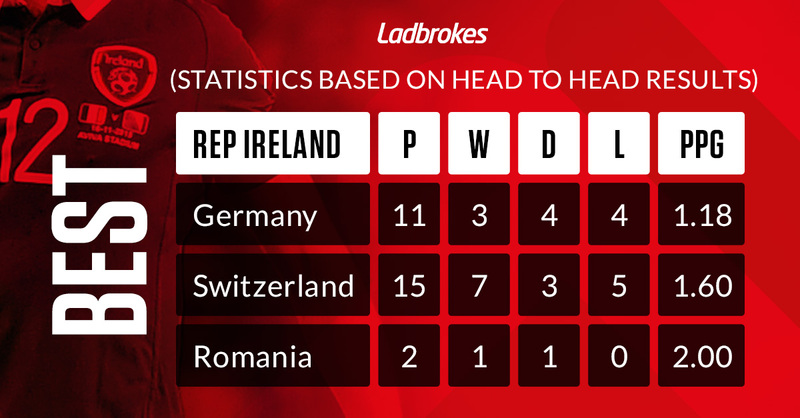 The Swiss would be ideal Pot 2 opponents, not just because their own passage was secured in unconvincing fashion, but because Ireland boast seven wins in 15 matches against them – leaving Romania as the optimal Pot 3 picks. If the above draw would be considered plum, this arrangement would be anything but. France are not only the hosts, they have beaten Ireland in all three historical meetings, most famously and controversially in the play-offs for World Cup 2010. 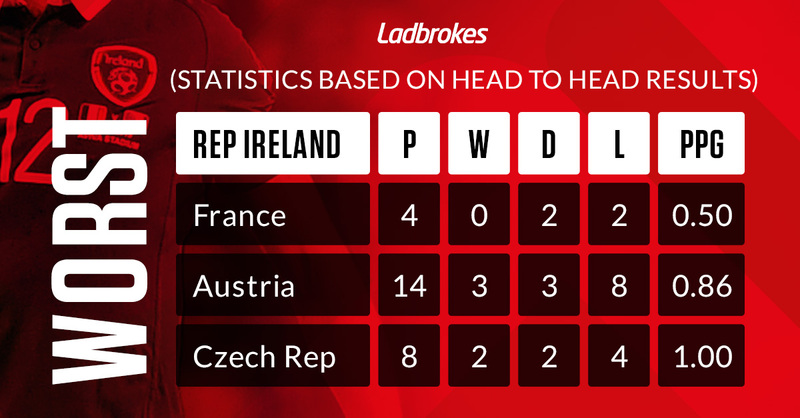 Austria make for very unappealing Pot 2 opponents having clocked up eight victories in 14 clashes against the Irish, not to mention they were one of the most impressive teams in qualifying. Compounding the misery in this mock-up nightmare are Czech Republic, who have enjoyed twice as many victories over the Irish down the years.